MILLION DOLLAR VIEWS! From This Highly Desirable South End Single Family Home with Heated Pool and 4 Stop Elevator. Offering Two Bay View Decks with Breathtaking Water, Wetland and Sunset Views Spanning over 180 degrees. 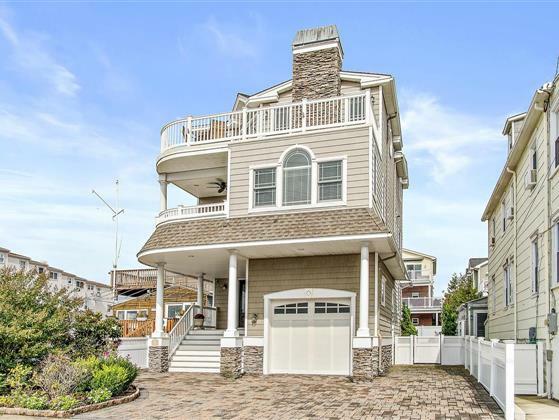 This Elegant Home has 4 En-Suite Bedrooms and 2 half baths plus Bonus Area only a Short Stroll to the White Sand Beaches of Sea Isle City's South End. Timeless design by Blain Steinman, and built by McLaughlin Custom Builders, makes this home perfectly suited to Fully Enjoy the Location- Close to Beach, Boating, Water Sports, Restaurants, Shopping and all the Shore has to Offer! The Exterior Features are highlighted by an exquisite Heated Pool with Waterfall, Carefully Selected Landscaping for Additional Privacy and Stone Pavers Surround. The First Floor Family Room has a slider that leads out to a covered rear deck and down to an in-ground pool in the rear yard with plenty of Entertaining Space around the Pool.